Acne sores can appear on the skin when the pores become clogged with oils and impurities, and then are infected with bacteria. Acne sores, otherwise referred to as acne pustules, are often pus-filled, painful and unsightly. Although there are many over-the-counter acne creams available, they are often formulated with strong chemical ingredients that can irritate the skin. However, acne sores can effectively be treated by using a few natural alternatives that can clear the skin without causing damage. Steam your skin to open the pores and allow impurities to drain out. Fill a bowl with boiling water. Lean 12 to 18 inches over the bowl, and cover your head and the bowl with a towel. Steam your skin for 5 to 10 minutes, then splash your skin with cool water. Steam your face once per day. Apply a lemon and aloe toner to your acne sores to reduce inflammation and increase skin cell turnover. Fill a spray bottle with 8 oz. of lemon juice, and add 1 tbsp. of aloe vera gel to it. Shake the bottle well to combine the substances. Spray your skin liberally, and allow it to air dry. Apply the lemon juice and aloe vera toner after steaming the skin once per day. Treat the acne sores with diluted tea tree oil to eliminate acne-causing bacteria in the skin. Place two drops of tea tree oil onto a cotton ball, and soak the cotton ball in water. Spread the diluted tea tree oil around your skin, allowing the oil to soak into the skin. Apply diluted tea tree oil once per day after toning the skin. When steaming your skin, it is important to lean over the bowl of steaming water no nearer than 12 inches, or the skin can become scalded. 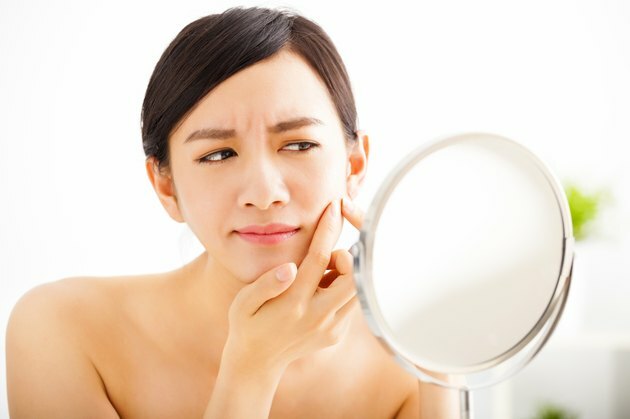 Acne sores can cause the skin to be more sensitive than normal, and using strong chemical acne products, such as benzoyl peroxide cream, can worsen irritation and can lead to redness and burning on the skin. Luckily, the Department of Dermatology, Royal Prince Alfred Hospital claims that tea tree oil can be just as effective in clearing acne as benzoyl peroxide can, but without causing irritation or burning on the skin.